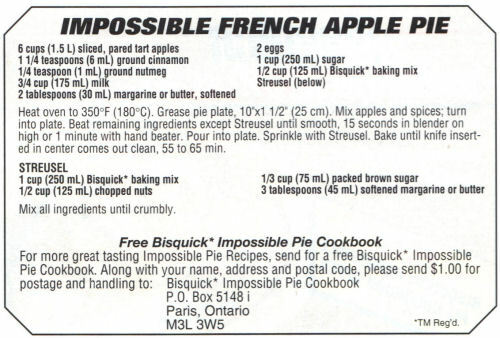 This promo recipe slip from Bisquick was found in a large collection, date unknown. I’ve typed it below along with a scanned copy. Heat oven to 350°F (180°C). Grease pie plate, 10″x1 1/2″ (25 cm). Mix apples and spices; turn into plate. Beat remaining ingredients except Streusel until smooth, 15 seconds in blender on high or 1 minute with hand beater. Pour into plate. Sprinkle with Streusel. Bake until knife inserted in center comes out clean, 55 to 65 min. 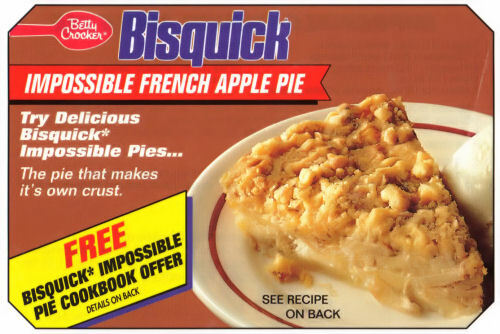 what is the bisquel baking mix essentially? I am celiac and i cannot just buy a baking mix… would there be anything to switch it with? I may be able to do gluten free? Bisquick is essentially wheat flour, vegetable shortening, baking soda and salt. Plus, of course, a long list of perservatives. Bisquick now has a gluten free products. I get mine at Hannafords.